Opinion: What is Lake Tahoe-Truckee’s environmental tipping point? We tried to go skiing at Squaw this past Sunday, but after 2 hours into a 30-minute commute, we had to turn around. It was Jan. 9, and it should have been reasonably busy, but not gridlock. So are traffic jams on off-peak weekends the new normal for our area? Traffic was backed up from Squaw to Truckee. OK, so gas is cheap and we finally have snow, but aren’t we supposed to have snow in the winter? A Jan. 8 Sierra Sun opinion piece entitled, “We owe an apology to Lake Tahoe and the Sierra Nevada” submitted by the Tahoe Regional Planning Agency, Tahoe Fund and others was particularly ironic since TRPA has been central to this issue by promoting large development projects such as Boulder Bay and Homewood without consideration for the harsh reality that we don’t have a comprehensive transportation system, adequate fire evacuation, or necessary infrastructure. The reality is there isn’t any planning or social engineering to manage all the crowds and litter. Ten pounds can’t fit in a 5-pound bag. Worse yet, TRPA appears to have given a wink of approval to the Martis Valley West/Brockway Campground debacle which plops thousands of people on the ridge at Brockway Summit. Fact: Our region is at or over capacity many times throughout the year. The Tahoe Fund is fueled by and has become the PR arm for large developers. It’s great that they are all so chummy, but where does that leave the public? Small conservation groups are left with having to protect Tahoe from phony traffic studies and bogus environmental analysis. I’m not saying I want six lanes like the South Shore, but obviously we need transportation solutions, not rhetoric. Token signs saying “Take Care” are a nice idea, but funds should be allocated for enforcement. When you have as many visitors as Tahoe does (I’ve heard 4+ million/year) there will always be a trash problem. Since Tahoe is close to the large population areas of Reno, Sacramento and San Francisco, shouldn’t we have a maximum number of visitors? Should there be a fee to handle impacts and transportation solutions? Should there be a penalty consequence for littering? Should Lake Tahoe become a National Park? 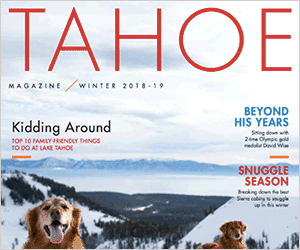 Maybe TRPA and the other authors of the article owe those who love and respect Lake Tahoe an apology for failing to plan for the real problems associated with increasing tourism. Ann Nichols is president of the North Tahoe Preservation Alliance. Visit ntpac.com to learn more.